On our first day at Abel Tasman, we drove over the never ending switchbacks of Takaka Hill to see a few locations to the north of the state park. We visited Te Waikoropup? Springs, where some of the cleanest water in the world rises out of the ground and forms a series of crystal clear pools, ate lunch looking across Golden Bay to Cape Farewell, and hiked to the waterfall at Wainui. Our final stop of the day was Grove Scenic Reserve, a huge jumble of limestone boulders strewn across a hillside like a sedimentary version of a Dartmoor tor. Rata trees and nikau palms grow among (and on) the boulders, and the whole place looks like it was designed by an over-enthusiastic set dresser for Lord of the Rings. 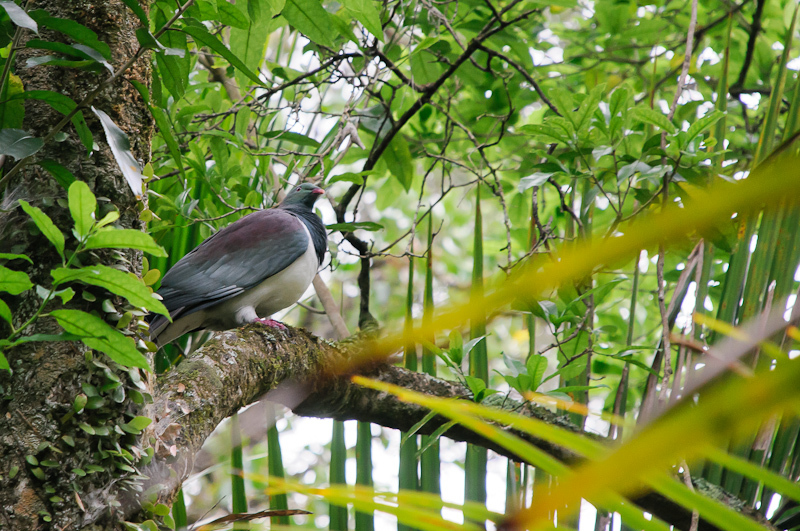 The rata trees contained quite a few New Zealand Pigeon or Kerer? (Hemiphaga novaeseelandiae) and the sound of their wings reverberating off the rocks seemed like it would be worth capturing. In the end the pigeons crashed noisily away just after I started recording, but a nearby Tui began calling, so I got two species for the price of one!